Historian, food writer, and restaurant critic Richard Collin (aka the “Underground Gourmet”) passed away last week. (Full obit here.) 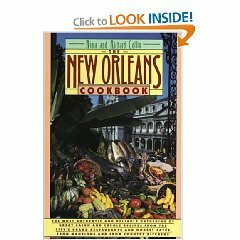 With his wife & co-author Rima, Collin wrote the New Orleans Cookbook, an excellent compendium of classic local recipes. Issued in paperback in 1987, the book is still in print. Unlike many modern local cookbooks filled with lush lifestyle pictures of the chef-authors frolicking and beauty shots of perfectly plated food, the New Orleans Cookbook is old school. It is filled with recipes and words, not padded with images. Collin’s scholarly expertise is apparent in the well-written introduction and headnotes, and his wife’s prowess in the kitchen is reflected in the recipes: excellent, properly tested recipes that can be executed in a home kitchen by a reasonably competent cook. If you don’t own a copy, buy one soon, in memory of Richard & Rima Collin. I have an old copy of the book that I bought in the 70’s, with a tattered, taped jacket. I’ve made many things out of it over the years, but the recipe we use most often now is the barbecued shrimp (with some modifications, such as using half the butter and oil and substituting shrimp stock and beer).